"El pobre es rico cuando esta feliz con lo que tiene...Y el rico es pobre cuando nada de lo que tiene lo hace feliz" Benjamin Franklin. In Acts 14, wherever Paul went to evangelize with Barnabas, Paul was the “chief speaker.” (Acts 14:12.) In Acts 16, Paul is preaching at Philippi, and is heard by a demon possessed woman known as Python. She was popular at Philippi as a soothsayer whom people paid for prophecies. Those aspiring to be kings and rulers would vie for her endorsement to gain acceptance from among the people. Large parts of Greece fell to Philip of Macedon because Philip bribed the Python priestess to prophesy he would conquer. (See infra.) The Pythoness thus was a 'rock-star' -- to use a modern equivalent. An anomian message of salvation means one predicated upon the negation of the Law which God gave Moses. For discussion of "Anomia" in Matthew 7:21, see ch. 5 of Jesus Words Only. See also our in depth study of the Greek word ANOMIA at this link. Jesus warns us in this quote that those coming with an anomian message who teach a salvation message that you need not obey the will of "my Father" and yet you will be saved anyway may cast out demons in Jesus' name, but this does not validate their false message. What Is The Spirit of Python? A "spirit of Python" meant a specific type of demonic spirit. The NLT of Acts 16:16 translates it simply as she is a "demon-possessed girl." However, OBH was short for the Hebrew word ABADDON which John in Revelation 9:11 revealingly tells us is APOLLYON in Greek. Scholars concur APOLLYON means APOLLOS, the Sun-god (son of Zeus, the head god) whose temple was at Delphi where the Python statue with multiple heads of serpents spoke through the priestess. See our article "Apollyon." So who is the Python in relation to APOLLOS? Apollo was the Sun-god among the Greeks. At the core of Apollo's temple was a pyramid known as the "tripod" to symbolize the Sun's rays. On this tripod sat a coiled serpent statue with three heads known as the Python. Technically, in Greek mythology, Apollo previously slayed the prophesying Python, but now through his female Pythia priestess at Delphi, also known as Python, the Python spirit spoke. See Leadbetter, "Apollo," Pantheon.org. 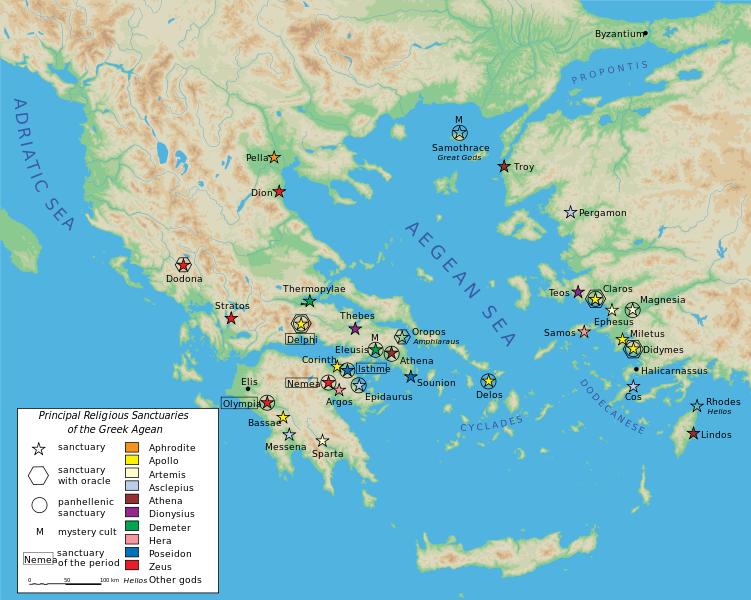 Delphos of Greece and its oracle became linked to Philippi in Macedon because in the 300s BC Macedon under Philip II seized parts of Greece by bribing the Python oracle to give prophecies of his success. It was said by Demosthenes that the oracle had become "Philipized." Id., at 146. "A remarkable expression. The damsel was possessed by an evil spirit....Python spirit, a word never occurring in the gospels....[T]he word Python would sound a note strong on the Greek and Roman ear. How much was contained in those words? Python was the prophetic serpent at Delphi, the center and focus of Gentile divination. The Python gave his name and place to the prophetic deity of the Gentile world. The successor of the Serpent of Delphi was the Pythian Phoebus or Apollo. And from him all who claimed the powers of divination received their title, and were called Pythons. [Author provides numerous examples from Greek literature.] Therefore this damsel at Philippi with her Pythonistic possession was, according to her degree, a representative of Pythia who sat on the tripod of Delphi, and who delivered the responses in the name of Pythian Apollo, the successor of the Serpent, and brought much gain and renown to her masters, at that place, and deceived the world by her sorceries. Hence. St. Luke calls the Spirit at Philippi, Python....The Python was an agent of Satan." Id., at 120. Predictably, this devout Christian author blinds himself to the importance that for "many days" this influential Python counterpart to the one at Delphi was endorsing the plan of salvation from Paul. This author simply goes on to say by virtue of Paul casting out the demon later that Paul teaches the Python was an "unclean spirit," and is "denounced and ejected by St. Paul." It never dawns on this author to question the significance of Paul's delay and the interim endorsement by what this author admits is a popular and influential "agent of Satan." How Is This Verse Typically Mistranslated? Obviously aware of the problem we are about to expose, most translations other than Young's Literal never properly translate this as "spirit of Python." So the King James simply has it the "spirit of divination." (Acts 16:16-19 KJV.) The New International Version is even wimpier, saying simply she had a "spirit." (Acts 16:16 NIV.) Virtually all the rest are in line. Now if this woman is demon possessed and Paul were following the true Christ, then her declaration to others to listen to Paul for salvation represents a house divided against itself. It makes no sense. But if Paul were following unwittingly a false Christ, then this makes perfect sense. Please distinguish this demon-possessed woman from the demons who recognized Jesus was Christ for the demons did nothing to consistently promote to others that Jesus was Messiah, Son of God, etc. Nor were the demons who recognized Jesus looked upon with high favor, and thus their recognition did nothing to help Jesus' ministry. See, Mark 3:11-12. But look at the very different evidence that 'the rock-star' demon Pythia (the priestess) promoted Paul for "many days" as having the true plan of salvation. In ancient Greece-Macedon, there was no more influential prophetess than the Python-priestess. She was routinely paid for her prophecies. But they should have questioned it, as this demon-oracle in the service of Satan was well-regarded by the pagans of the area. Why would Satan through her deliberately try to promote Paul's ministry? Luke's account does not give this a second-thought even though the account clearly requires the Berean in us to do so. Hence, one can see that if Paul were serving the true Christ, demon spirits like Python who were popular and influential would not for "many days" go around following Paul telling people to accept Paul's "plan of salvation." And notice, the demon spirit of Python did not say to follow Christ, but specifically to follow Paul's plan of salvation. In Acts 16:17, the demon Python-spirit says: " `These men are servants of the Most High God, who declare to us a way of salvation;'" So the message of Christ on salvation was not being promoted, but instead the demon was promoting Paul's very different plan of salvation. On the difference between these two gospels, see our page "Paul's Contradictions of Jesus." Hence, Acts 16:16-17 is further confirmation that Paul was unwittingly serving Satan. We already deduced this about the appearance to Paul and others with him of someone saying "I am Jesus" on a wilderness road when Jesus warned us not to trust when someone "comes in my name" in the wilderness (see Matt 24:5, 24-27) because the only way Jesus will be seen on earth after the Ascension was if every eye on earth sees Him. (See link.) But that is not what happened on the road to Damascus, is it? Then what about Paul casting out the demon in Jesus' name? Does this prove Paul knew the true Christ? Emphatically NO! In Matthew 7, Jesus said many who work "ANOMIA" (negation of the Law) will be able to say they did many miracles and cast out demons in His name, but Jesus will say He never knew "you" to them. It thus proves nothing. Jesus may indeed have cast the demon out as a mercy to this young girl. His name is powerful. What is important to take away from the passage is Paul, the self-avowed worker of appearing ANOMOS (see link), did not know the true Christ because if Paul did, then why would a popular and influential demon promote for many days Paul's plan of salvation? That would be a kingdom divided against itself, and Jesus said, in essence, that such things would not be true. Hence, it logically follows Paul did not "know" Christ, contrary to Paul's assumption of whom he met on the wilderness road outside Damascus. Was This Experience at Philippi a Turning Point? Then remember that the first Christians at Philippi were only positively directed to Paul initially by the Python priestess of Philippi. She was the most influential prophetess of the ancient world -- to whom many paid for her prophecies. Yet, we concluded above -- which Luke apparently chose to overlook the implication to a Christian audience -- that when she endorsed Paul's "plan of salvation," she was under the influence of a demon until Paul "many days" after her endorsement then finally cast out that demon. So Pauline Christianity first received its financial boost from a group of Gentiles who were first influenced toward Paul by a demonic spirit! How Important Was The Python Fact to Victory? Luke addresses both his gospel and book of Acts to the same person: Theophilus. The account ends with Paul heading to Rome for a trial. The legality of Christianity stood in the balance. If it is just a sect of Judaism, and Paul is not a radical who committed a crime against Judaism, Christianity will survive as a legal sect. If Paul is founding a new religion outside of Judaism, and Paul committed an offense at the Temple against a legal sect, then Christianity may be outlawed. Christian scholars agree that how Luke addresses Theophilius indicates this was a trial brief to advise Theophilus for the upcoming trial of Paul. See link. Thus, Luke is addressing PAGANS, not Christians, to win an acquittal for Paul in a pivotal trial for the survival of Christianity. Luke succeeds. This first trial in front of Nero ends in an acquittal according to early church historian Eusebius in his The Church History 2:22 written ca. 325 AD. Hence, Luke might have known among Christians that a demon endorsing Paul is a negative fact. However, Luke at the same time knew that among Pagans, to tell them the Python Priestess of Phillipi had "endorsed the way of salvation" taught by Paul, that is all they have to hear. If this proves confirmed, the case is over. Christianity survives to a pagan court because the Greco-Roman world's pagan religion will obey and listen to the Python as the light to emperors and peoples everywhere. Luke thus made a calculated risk to reveal something that Bible-astute readers would see as a hurdle for Christians to accept Paul at all, knowing that a Pagan court would instead use the Python priestess words as a key fact to rule in favor of Christianity. It would no longer matter who Paul offended or did not offend. Accordingly, it is likely that Luke did see this issue, but the legal survival of Christianity was more important than shielding Paul from the embarassing aspect which Christians would readily recognize once pointed out. Why did Paul get annoyed with the Spirit of Python promoting him after "many days" instead of initially? For why would a man of God want a demon promoting him? Scholars concede this while trying to flip it the other way: "it is something of a puzzle why he resented the girl's cries [of support]." (Henry Ansgar Kelly, Satan: A Biography (Cambridge University Press: 2006) at 56.) The best explanation is Paul let this go on many days without rebuking the demon because it was helping until Paul realized that people would start wondering why demons were promoting Paul. Contrast the situation with Jesus in Matthew. At every encounter with demon-possessed people, Jesus cast them out of the person. Jesus did not leave them in their state "many days" to serve any personal advantage if they would identify Him as Messiah. A unique situation is presented in Mark that did not appear in Matthew. Mark is the Gospel scholars have deduced was written by a Paulinist, eliminating all prophecies critical about Paul in Matthew. See "Marcan Priority Claim." In Mark 3:11 et seq. Jesus apparently leaves the demons in place (unlike Matthew where Jesus always cast them out.) What happens is per Mark Jesus during a healing activity of many people tells "unclean spirits" who cried out "You are the son of God" not "to make him known." Unlike Paul, Jesus in Mark 3 did not want anyone to perceive these "unclean spirits" as declaring His identity, so as to prevent the endorsement of demons. By contrast, Paul welcomed the support of demons. Python. The Roman historian Lucian records that "the dragon under the tripod spoke" at the Temple of Python. In the temple were kept a host of snakes. It is assumed "dragon" here meant one of the snakes. The tripod on which the pythoness sat was another relic of the religion which it had superseded, for it was formed of a serpent of bronze, coiled spirally upwards in the form of a cone, and terminated in three heads. As the cone or pyramid was a symbol of the sun's rays, this typified the worship of Apollo, the Sun-god with that of the Serpent, the python, the earth deity. The method of words of prophecy by the Python have a chilling similarity to modern 'words of knowledge' and 'glossalia' that I have personally witnessed in certain churches. I can verify words of knowledge are often amazingly accurate depictions of people, with their past excellently described by pure strangers, mixed in with some future promises that often are safe bets. Now remember, the gift of tongues of the 12 apostles was different: it was the ability to speak to foreign language speakers, and the listeners would hear it in their own language. See Acts 1. So here is what is so chilling to consider to explain how our modern behavior may have entered the church from copying practices of the Pythonesses of ancient Greece. Anarcharsis in a travel journal of the 6th Century before Christ identified that "toward the middle [of the temple] is an aperture from whence came the prophetic exalation." (Howey, id.., at 144.) The young virgin would drink some water which "it is said [has] the virtue of disclosing futurity." Id. Interestingly, the young prophetess would have her limbs suffer "involuntary motions," and she uttered "plaintiff cries and deep groans" (id.) She then uttered "dreadful howlings which were eagerly collected by the priests." Then the priests went to work. Anarcharsis continues: "They arranged them in proper order, and delivered them to us in writing." Id. The Greek term "python" had a secondary meaning of divination and the "belly talking," as if a ventriloquist speaking in a strange voice. See Mark Nanos, at 24. Philippi is in Macedonia, while Delphi is in Greece 100 miles north of Athens. The word translated as "vipers" in NT may mean python. EKHIDNA (or Echidna) was a monstrous she-dragon (drakaina) with the head and breast of a woman. She probably represented or presided over the corruptions of the earth : rot, slime, fetid waters, illness and disease. She was often equated with Python (the rotting one), a dragon born of the fetid slime left behind by the great Deluge. Others call her the Tartarean lamprey, and assigned her to the dark, swampy pit of Tartaros beneath the earth. Hesiod, makes her a daughter of monstrous sea-gods, and presumably associates her with rotting sea-scum and fetid salt-marshes. In all cases, she was described as the consort of Typhoeus, a monstrous storm-daemon who challenged Zeus in heaven. Together they spawned a host of terrible monsters to plague the earth. Other closely related she-dragons included the Argive Ekhidna and Poine, the Tartarean Kampe, and the Phokian Sybaris. In the image (right), Ekhidna is equated with Python. Apollo seated on the omphalos stone slays her with his arrows : in the motif of healing god (Paian) destroying plague-bringing demon. It is without exaggeration to say that apart from the Saviour, the Apostle Paul is the greatest benefactor to the human race because the Lord used him to give us the most advanced teachings. When you see what was revealed to Paul, what motivated him will begin to motivate you. There is no other way the desire to go out and fulfil this grace mandate can infuse you except by you receiving the same things that the Lord Jesus Christ revealed to the apostle Paul; what made him a great theologian and at the same time a great missionary. Thus, the author of Theosis believes Paul came with a different more advanced Gospel than Jesus taught the 12. This is clearly a sign that the Python Priestess passage explains why this was true. The most influential demon spirit of Paul's age endorsed Paul's "way of salvation" for many days, and Paul did nothing until finally he cast the demon out of her. Hence, what this quote from Theosis proves is that the author realizes Paul's gospel is more "advanced" (different) than Jesus' gospel which was supposedly 'less advanced.' The explanation for this difference is right there in Acts 16 - Paul taught a gospel "way of salvation" that demons approved. Also, we see the difference by comparing what Theosis regards as the "less advanced" Jesus' Gospel which teaches, for example, that works worthy of repentance are necessary to appease the one you offended prior to you or I bringing our atonement offering -- Christ's blood -- to God to cover ourselves -- Matt 5:23-26 TLB, versus Paul's more "advanced" teaching that if you merely "believe Jesus died for your sins and rose from the dead you shall be saved" (1 Cor. 15:1-5.) But the demons believe such things, and cannot be saved. James deduced therefore that such a "faith alone does not justify" (James 2:17, 24 (faith alone -- without works - is dead; and by works, and not by faith alone, is a man justified.). Hence, the role of the Python Priestess in Acts 16 perfectly explains this material difference -- the true Gospel of Salvation which Jesus taught versus the Gospel of Salvation that Paul taught which THE MOST INFLUENTIAL DEMON OF THAT ERA ENDORSED TO PAUL'S GREAT ADVANCEMENT IN THE EYES OF PAGANS.